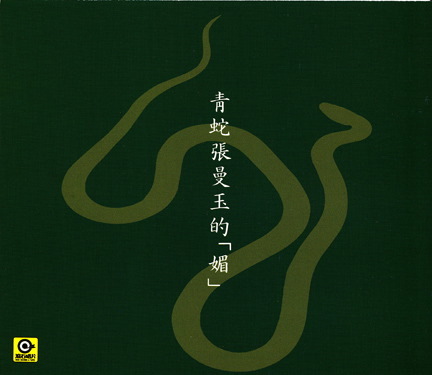 Huang Zhan and Lui Tsung-tak's score for Tsui Hark's wonderful fantasy film Green Snake is the 224th Soundtrack of the Week. I saw this at the Music Palace in Chinatown when it first came out, and later on video several times. (I can remember when there were four movie theatres in Chinatown. They're all gone. The Music Palace was the last to go.) 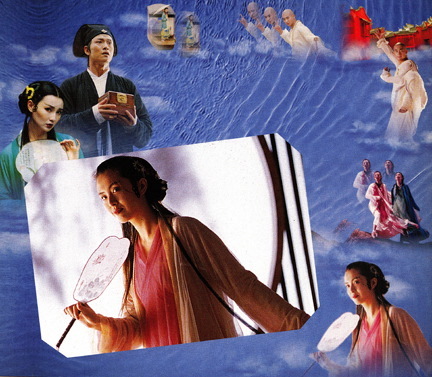 It's kind of like Blade Runner retold as a Chinese myth. It's about giant snakes who want to be human. 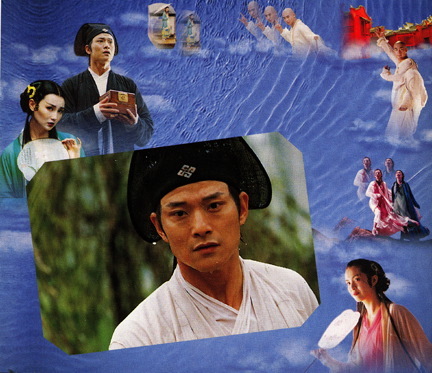 One of them, played by Joey Wang, falls in love with a human and wants to settle down. The other, played by Maggie Cheung, is more of a mischievous, fun-loving type. They're pursued by a Buddhist priest whose mission is to make sure that creatures like them don't cross over into the human world except by reincarnation. (That's how I remember the plot, anyway). It's a great movie, slightly marred at the very end by some special effects that can't keep up with Tsui Hark's demands. I bought the CD at the record store right next to the Music Palace. Hey, what do you know, that place is gone now too! For the moment, though, it's hanging in there as P-Tune Music on Christie Street. I still buy DVDs there regularly. 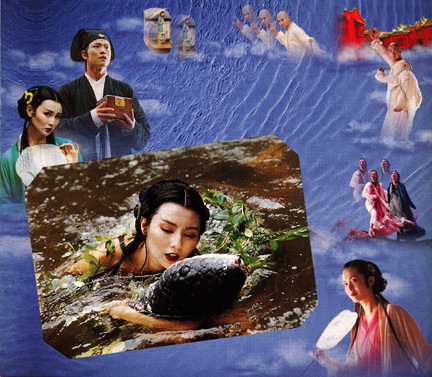 The Green Snake soundtrack CD includes reproductions of the lobby cards from the movie. This is what the back looks like, in case you want to make your own set. And now the music. Most of it sounds like synth, vocals and percussion, with the synth sometimes apparently emulating traditional Chinese instruments. The first track is a lush, atmospheric track with a beautiful melody of understated longing. There's a B section that picks up the pace with a rolling kind of groove. AFter that comes a powerfully romantic number that sounds like the first track's restrained longing has broken loose. I think this accompanies the scenes of Joey Wang falling in love, experiencing human emotions for the first time. The third track introduces danger with ominous low tones, high string lines and nervous percussion. 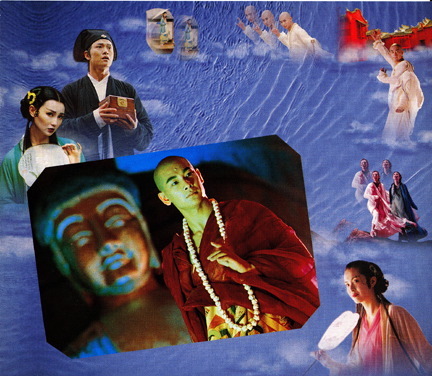 Then come prayer drums and chanting as the monk pursues a non-human, if I remember the movie right. Track 4 is a 3/4 piece that starts out carefree but then runs into menace as serious and threatening tones come crashing in. The use of percussion here is impressive, as it is throughout the record. The fifth track was always my favorite. When Maggie Cheung becomes human the first thing she does is seduce a female South Asian dancer. This is the lovely and catchy song for that scene, which uses sitar, tambura and tabla. I've put this one on mix tapes. Then there's a textural track of droning voices and percussion, with some other instruments coming in. This is followed by a short cue for the "humanity" theme, creating a mood that's lovely and sad, expressing the beauty and hardship of human life. Track 8 is slow, sensual, lush and funky, with deeply melodic wordless vocals and a Chinese violin solo. After this comes music for danger and action. Then a gentle piece featuring flute and harp at first, and then the ensemble with another lush atmosphere. This continues in the next track but with the addition of a violin and an unexpected minor chord. Track 12 is the dance remix of Maggie's big dance and seduction scene. It's basically the same track with big electro-percussion added. I wonder if this was released as a single. Most of the rest of the tracks are different takes on one or another of the themes already heard. Track 17 features some unusual "water" music, perhaps using a rain stick. Track 18 has some breaks that sound like gamelan music. There you have it. One of my favorite scores for one of my favorite movies.